Click* the shield to toggle** its effect. You pay the listed SPCost† per turn to make the monster take -6 MRM and you gain +6 MRM. **The shield drains some of your opponent's defensive essence! **You shift your focus, and the power of the scarab stops flowing. *†You lack the «» SP needed to call upon the power of the scarab. 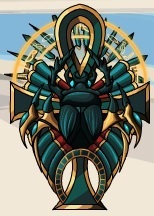 This shield gives you the same blocking that a scarab's tough exoskeleton gives it! You can also click on it to drain some blocking from your foe to toughen up the shield and make you harder to hit! November 5, 2015: The shield was released.